What we know: the HP Envy looks great. What we don't: what will performance and battery life look like, long term? The HP Envy x2 joins a growing cohort of Surface Pro clones, but with one big difference: Inside it is a Snapdragon 835, offering battery life of up to 20 hours. We spent a little time with it at the Qualcomm Technology Forum to see what a new chip would do in an established category. Externally, HP’s Envy x2 changes another key thing about HP’s line of Windows tablets: it removes the kickstand from the tablet itself and puts it inside the keyboard case. Normally, that’s a risky decision: Samsung’s Galaxy Book is an otherwise excellent Windows tablet, but its keyboard case doesn’t allow the flexibility of a true kickstand. 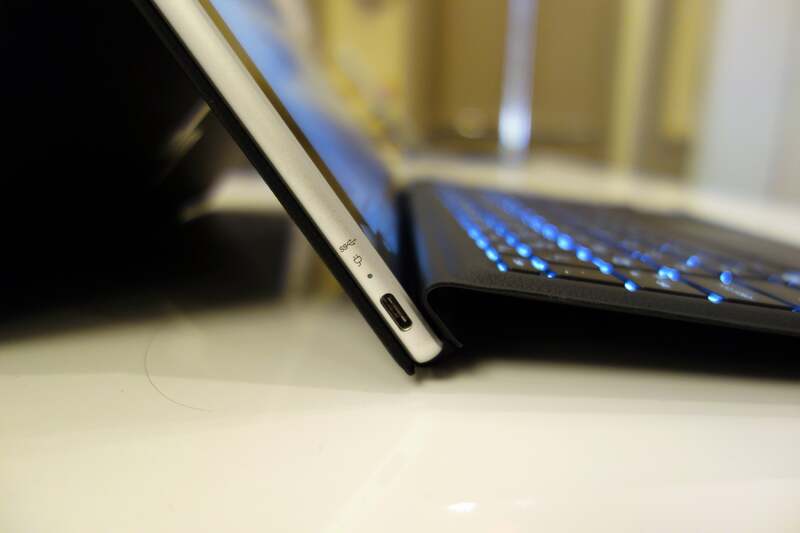 The hinge is now part of the keyboard cover on the HP Envy x2. Between the Asus NovaGo ultrabook (also introduced Tuesday with a Snapdragon 835 and the Envy x2, the Envy x2 is clearly the more eye-catching design. We know a bit about it: Kevin Frost, HP’s vice president and general manager of Consumer Personal Systems, said it would include 4 GB of RAM and 128 GB of storage, as well as the 2.2GHz Qualcomm Snapdragon inside of it. It will ship in the first quarter of 2018 for an undisclosed price. That kickstand, though, intrigues me. 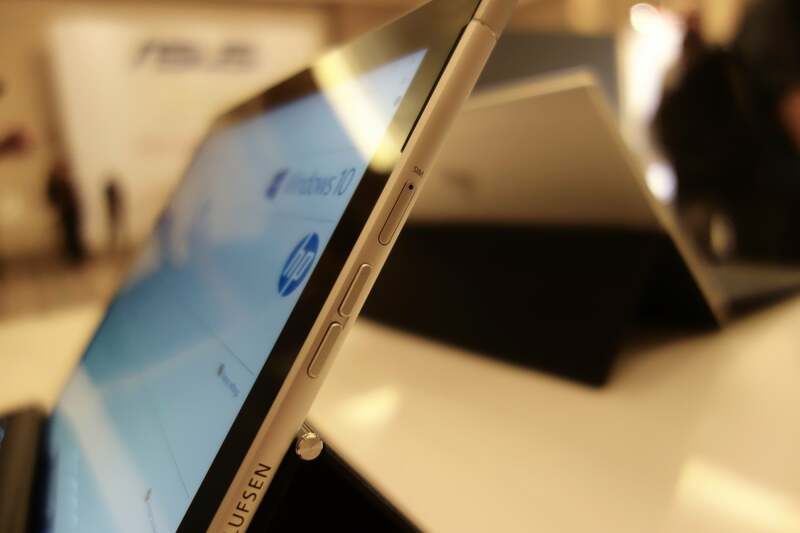 HP’s 12.3-inch display contains a 1920x1200 display, connected to a detachable Surface-like keyboard cover with an additional folding hinge. Normally, that hinge is included as part of the tablet. Here, it’s part of the cover, and removing it leaves you with sort of a giant floppy folding sheet of pleather and a silvery tablet without any way of propping it up. That’s a gutsy design call, and time will tell whether it’s the right one. 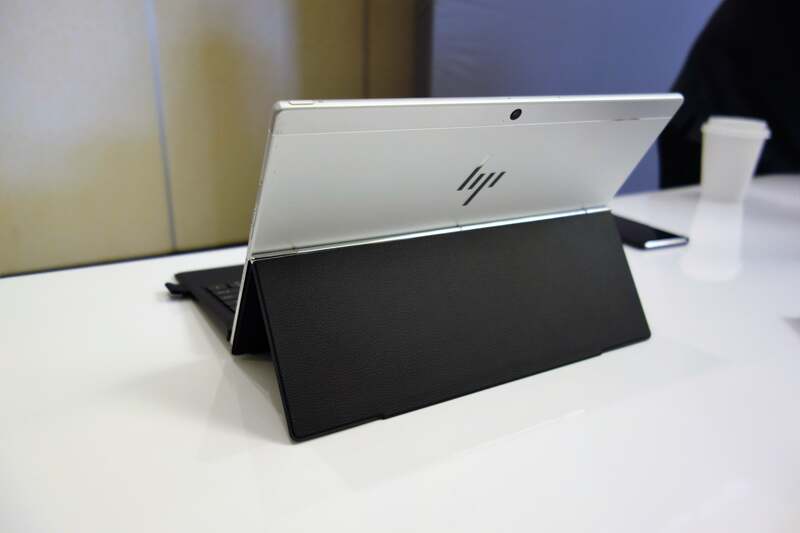 The HP Envy x2 includes a USB-C port (without Thunderbolt on the left-hand side of the tablet. The Envy x2 endorses the USB-C connector, though there’s only one, tucked low on the left-hand side and used for charging and I/O. Unfortunately, it lacks Thunderbolt capabilities. The only other way to tell that this is something a bit different is the SIM card slot on the right-hand side of the tablet—indicative that HP included Qualcomm’s gigabit modem inside, and probably a foreshadowing of similar SIM card slots to come. A SIM card slot appears on the right-hand side of the Envy x2 tablet. Battery life will be the selling point, though, even if it’s still not quite clear what it is. If you read the fine print under Frost’s presentation on Tuesday, it revealed an interesting configuration: in addition to 8GB of storage—the Envy x2 has 4GB —the 22-hour battery life claim was predicated on an anemic 150 nits of brightness. That’s substantially less than the 250-260 nits's brightness that PCWorld considers a typical setting for indoor use. It’s certainly possible that (surprise!) manufacturers could be playing a bit of hanky-panky with battery-life numbers. We simply won’t know until we have a chance to put the Envy x2 through its paces. Both the HP Envy x2 and Asus NovaGo run Windows 10 S, the version of Windows 10 that restricts users to Windows Store apps. 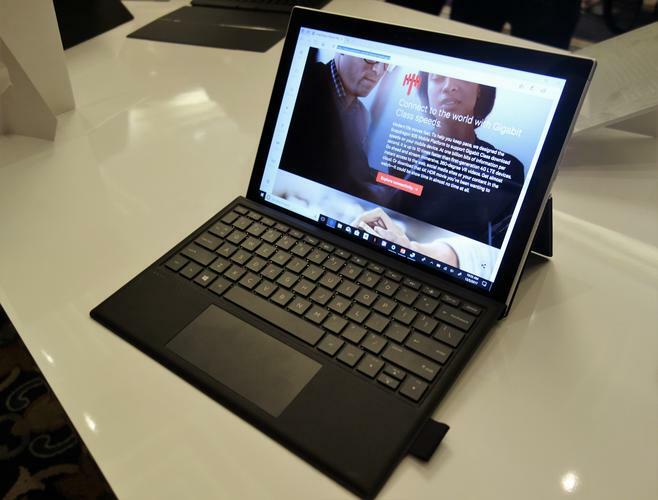 You’ll have a free opportunity to upgrade to Windows 10 Pro, though that will offer up a new wrinkle: Qualcomm’s Snapdragon chips run traditional, non-UWP apps via emulation, and performance will suffer somewhat--though again, we don't know how much. In a presentation at Qualcomm's event, Microsoft did say apps are emulated, and code is stored locally so to help improve performance the second time around. 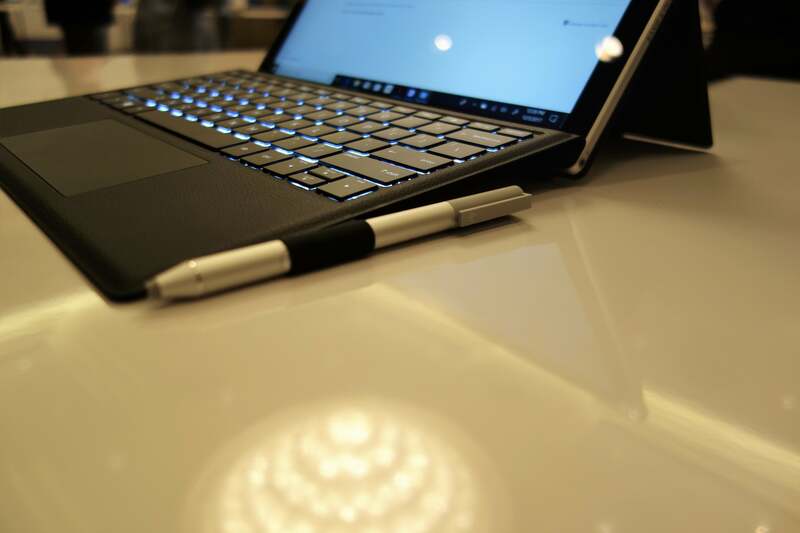 We’re not sure if a pen will come standard on the HP Envy x2, but the company was showing one off this week. Probably the most commonly used non-UWP app is the browser, which means that choosing Microsoft Edge—a UWP app—over a browser like Chrome may have a significant effect on your laptop’s performance. Pat Moorhead, an independent analyst, said a Qualcomm-powered device he was able to test for a few days delivered performance that was better than expected. When I upgraded an Asus NovaGo to Windows 10 Pro and then ran Chrome, however, webpages took about twice as long to load on Chrome versus Edge. As I said in my hands-on with the Asus NovaGo, it’s simply too early to tell what long-term performance will be like with the Envy x2 or other Snapdragon-powered devices. Qualcomm executives would like us to skip canned benchmarks entirely in favor of more “experiential” metrics. We’ll take that advice with a grain of salt, but they’re right that living with a device like the HP Envy x2 will be a different experience than it would be for a typical PC. We’re eager to find out.